Heart of Bronze Book 2! The Heart of Bronze story continues where Clockwork Looking Glass left off, following the witch, Pandora, after her confrontation with the evil Teivel Hearse! Lost, weary, and beaten, Pandora heads off in search of answers, and finds herself in the care of a kindly old Property named Scribbler John. To survive, Pandora must help John find his freedom from a band of greedy airship pirates even as the vile seed of Teivel Hearse grows rapidly inside her. So, you've read Clockwork Looking Glass and Clockwork Pandora, and you've been waiting impatiently for the next book in the series. Why not tune into the Heart of Bronze radio "dramedy," STEAM ROLLERS ADVENTURE PODCAST while you await the next book? "SRAP" continues the adventures of the Heart of Bronze through the eyes of new characters created for a role-playing adventure game spun from the pages of Clockwork Looking Glass. In SEASON ONE, three very different characters find themselves on the wrong side of a new Civil War, pawns of the dastardly Thorne & Hearse corporation, and the Clockwork Carpenters. Can they stop global destruction with the help of a mechanical manservant, an Imperialist witch, a psychic, and anyone else they can enlist? In SEASON TWO, two new parties of mismatched adventurers, including a singer-psychic, a cogman automaton, an inventor, and a Robin Hood style cowboy, join forces with a Glass Cavalry soldier and a Texas bounty hunter to solve the mystery of something called The Principle Engine. 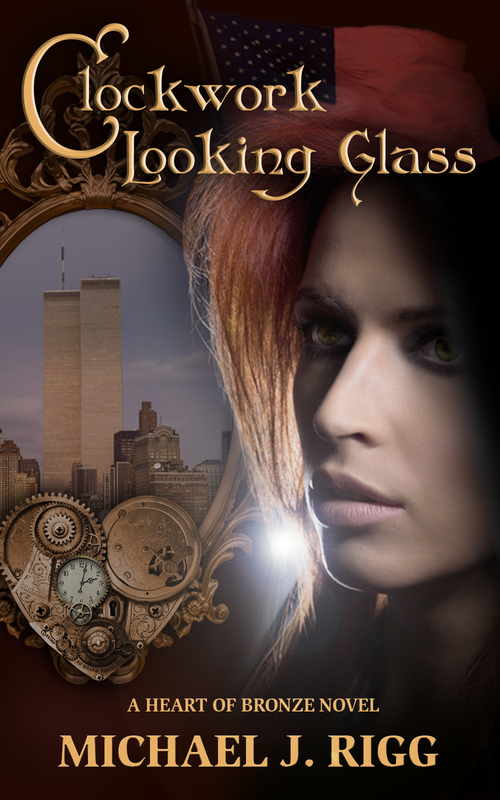 Can they solve the mystery before the Legions of the Glass Witch stop them? In SEASON THREE (currently in production), two factions fight against each other as the Imperial United States and the Confederation of States are thrown into war. In this season, the gameplay and role-play of our cast will actually decide who wins the war, and that result will play into Heart of Bronze canon into the next novel and beyond! Tune in to the weekly adventure to find out! DEBUT AT #2 ON THE AMAZON "HOT NEW RELEASES" IN THE SCI-FI/STEAMPUNK CHARTS AND #1 IN TIME TRAVEL! "★★★★★ CAUGHT UP IN A WONDERFUL STORY!" "★★★★★ QUITE A RIDE! HARD TO PUT IT DOWN!" "★★★★★ GOOD CONCEPT FOR A TIME TRAVEL BOOK. NEW & REFRESHING!" "★★★★★ THRILLS, CHILLS AND UNEXPECTED TWISTS!" "★★★★★ I FELL COMPLETELY IN LOVE WITH THIS BOOK!" "★★★★★ SUCH A TALENT FOR STORY TELLING!" "★★★★★ NOT A DULL MOMENT!" "★★★★ A SOLID ENTRY IN THE STEAMPUNK GENRE!" "★★ THE CHARACTERS ARE MOSTLY WELL-FLESHED!" I swear I didn't make all that up. Click one of the links and read the reviews for yourself. The first story in the Heart of Bronze universe, Clockwork Looking Glass, is available at Amazon.com, and the NEW paperback is available at Amazon.com, Barnes&Noble.com, and CreateSpace.com. Begin your adventure in the thrilling Steampunk/SciFi/Romance/Adventure that transcends time and bends reality. She woke up naked and alone with no memories, staring up into the eyes of a handsome soldier. She had no idea who she was, how she got here, or the fact that her presence would change reality forever. Clockwork Looking Glass follows the journey of “Alice” as she struggles to make sense of her surroundings, piecing them together with the strange visions and nightmares that are her only link to who she really is. With the help of a dashing Confederate officer, a teenage witch and a paranoid manservant, Alice soon discovers that this world of airships and Tesla towers is prowled by ghastly magic-wielding monsters, ghostlike “Clockwork Carpenters,” and the cannibalistic greed of corporations like Thorne & Wolfe. It's a fantasy set in an alternate reality, an urban Steampunk universe that moves from the bronze and iron towers of New Yorke and haunted Philadelphia to the plantations of Louisiana, the Citadel of Thinking Machines and finally to the key that could bring Alice home... or destroy everything: Atlantis.